Soon after midnight Oana wakes up to the sound of grunting winches: wind must be up and Glen reverts to sailing mode. Fair enough, but the engine is switched on-off several times, as the propeller is not folding properly, again. The ‘put sails away and reverse at full blast’ technique sorts it out, same as 3 days ago. Something is clearly wrong with this prop. Hm, another item added to our already long list of things to check/service. By 2am an unexpected westerly wind seems to be stabilizing 9-11kts on our beam, we’re doing a boat speed of 6.5-7kts and SOG 10.5-11kts, due to now 4kts of Gulf Stream current. And when the wind gusts above 13, SOG gets 12+kts… this is going to be fast! While it lasts. An hour later the wind reverts to what was forecasted, SW 5-6kts. Which slows us down, and it feels like Cloudy Bay is sailing over speed bumps. Hm, we like the extra 4kts that Gulf Stream gives us, but can we put up with this jerky movement and sails flapping? 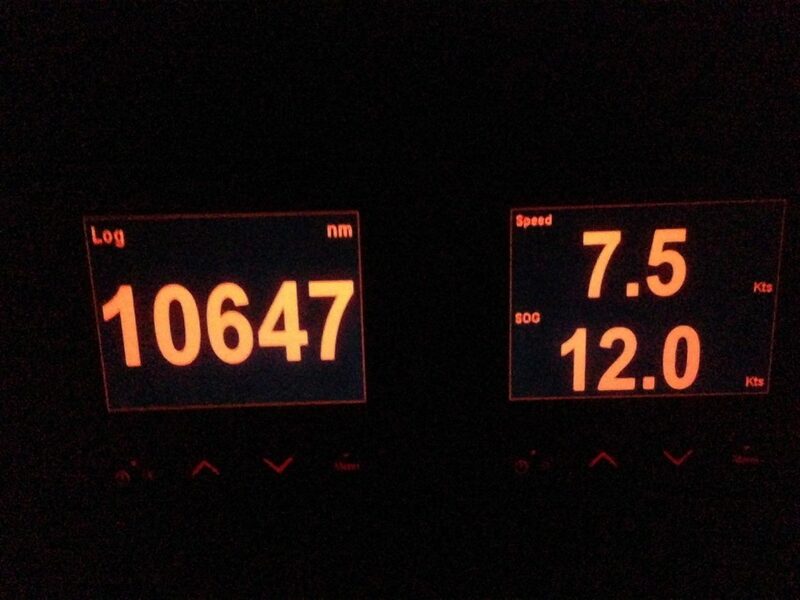 Nope, not at 1.5kts boat speed. So at 3.30am genoa furls away and on comes the donkey again. Well, at least we know fuel will be cheap in USA! Dawn rewards us with a wonderful sunrise over calm but rather lumpy sea. Over half way now. This 12kt SOG makes us feel like a speed boat – we are just eating up the miles. We stay 50miles offshore in the strongest current which is now running at 4.3kts. We need to decide when to swing to port, so that we don’t overshoot St.Augustine! We are level with Cape Canaveral by 9am and the chart says “beware, rocket impact area”. We imagine just how many old space rocket boosters we are passing over. We had seen large parts of boosters washed away on beaches in St.Lucia and Mustique …. so some obviously didn’t sink too quickly. Mid-morning we switch off the engine and we have a calm, gentle sail, 4.5kts of current still with us. Sailing port tack hard on the westerly breeze, with autohelm set on “wind”, we are almost going in the direction we want to go, towards St.Augustine. And so the decision is made for us, we start to gradually move west and out of the Gulf Stream. After 30 minutes on this course we notice a distinct line in the water. Our side is calm whilst the other side has small waves, some breaking. Clearly the Gulf Stream really does have sharp boundaries. As we cross the line the current diminishes and we see the water temperature decrease. Quite a phenomena indeed. As we are sailing along calmly in 5-6 kts, Glen is inspired to fly the drone off the boat, the first time he does this when we are actually sailing. Taking off was a bit tricky. The drone uses GPS and on take-off it stays in the same geographical spot. But as the boat is moving, as soon as the drone is airborne it appears to fly very quickly off the back of the boat! First attempt caught Glen off guard but he managed to catch it before it hit the back stay! Second attempt, the controller stick was hard to left to get it clear of Cloudy Bay until a safe distance away. He was very nervous during the flight, as the technique was quite different to normal. Landing was equally nerve-racking as you have to be flying forward as you land. Guess this is like landing a helicopter on the deck of a moving ship! Our practiced technique of Oana catching the drone paid off, and we landed it just fine. Then we dive to the PC to see the long awaited footage. There is not a yacht owner in the world who doesn’t want to see their own boat sailing, and we are not disappointed. Definitely encouraged to try again. But maybe with some valium next time! At 3pm we are 55nm away from our destination, and it’s so weird to see depth of only 30m so far from the shore, after looking at depths in the thousands of meters for the last 2 weeks. Due to the help of the Gulf Stream we will arrive a lot earlier than we planned for. Very good progress at 239nm (over ground) in 24h, an absolute record for us. Previous record was 199nm. As we get into VHF range there are several US Coast Guard emergencies we listen into. A fire on a boat, a 21ft fishing boat missing, a disabled 41ft sailing boat. Ooh such drama …from the country of Drama Queens! Our welcome to the US territorial waters is a nice sunset, with a red glow from behind the clouds. 8.30pm, we will definitely enjoy the longer days here! As a dark night sets in, there is lightening on the horizon all around us. Looks like we managed to squeeze between the storms. We are 13nm from St.Augustin and as we start seeing the lights ashore, reality sinks in: we will need to feel our way into the channel. For the first time ever, we do not have a pilot book, so we rely on the info from the chart only. One by one we identify the radio masts, lighthouse, etc. feels like the days before GPS! In the last couple of hours the wind picked up, giving us a thrilling ride at 8+kts exactly when we didn’t really need one, but we are happy to finish our journey in style, with a blast. It’s almost like Cloudy Bay was desperate to get there. It’s dead low tide. The ebb has just finished so we wait up to see what happens to the anchor when the flood sets in. We try to check in by calling Customs & Boarder Protection …. but no answer. We’ll try again in the morning. Then we relax! Congratulating ourselves on a journey well done. Since leaving Antigua we had a total trip time of 11.5 days covering 1534nm. That’s the longest we have done with just the 2 of us. Tomorrow we step foot in USA …. if they allow us!